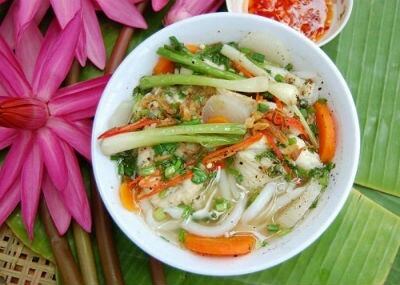 Mi Quang – Quang style noodle – is a unique dish amongst other noodle dishes – a one must try dish when coming to Danang. From the first look, you can see green vegetables and herbs (water mint, basil, coriander, chopped green onion, lettuce, sliced banana flower), yellow and shiny white noodles and light – clean brown red broth and simmered proteins (shrimp, pork, chicken, or even fish and beef). For placing, vegetables are placed atop of a bed of rice noodles in a bowl, topped with protein and added warm broth just enough to wet the other ingredients. Extra grounded – grilled peanut and pieces of toasted sesame rice crackers are finally added. Based on those main ingredients, the cooks can play on their own design which can give customers different experience when enjoying the noodles. The aroma and the taste is a mouthful enjoyment. One bite must include all, noodle, vegetables, herb, protein and other extras. The first taste is the freshness of vegetable and herbs, coming up with the crunchiness of peanut and sesame rice crackers, follow up by the tenderness of the proteins with a bit chewiness from the noodles, all mixing together in harmony with the intensive flavor broth – seasoned with fish sauce, black pepper, shallot and garlic. The beautiful aroma is added with a hint of peanut oil. Like most of Vietnamese dishes, the noodles contains itself the theory of Yin-Yang. The contrast of Yin – the cold noodles and vegetable against Yang – the warm of and the intensive flavor broth. This contradictory made the dish not so hot like Pho or Bun Bo but warm (the broth) and fresh (the vegetables) when serving. This character is suitable to the weather of the central region – hot which is the reason why the dish can be served as breakfast, lunch and even dinner. A hot and hearty bowl of rice vermicelli, atop with thin slices of marinated and boiled beef, herbs (chopped green onion) and soup is the distinctive dish that you must try when come to Danang. Unlike Pho which the main flavors come from anise star, cinnamon and other spices, Bun is much simpler with the predominant flavor of Lemon grass. The broth is a result of a long cooking process with beef bone or beef shank, lemongrass, fermented shrimp sauce, sugar and very spicy chili oil. The result is a light brow and clean hot broth with a beautiful balance of spicy, sour, salty and sweet and the flavor of lemon grass. *Attention: Some people may not like the steamed blood so remember to tell them put it aside if you are the one. Another must try dish in Danang is Banh Canh, a kind of noodle soup with variety of adding and topping. Unlike Bun, Pho or Mi Quang, the noodle of Banh Canh is much thicker which is made of three different kind of ingredients rice, wheat or tapioca mixed. The soup is a simple broth with pork bone, fish or shrimp/ crab, seasoned with fish sauce, pepper. There are several kinds of Banh Canh but the most popular in Danang is Banh Canh Cua – a rich, thick crab soup, often with the addition of quail eggs; Banh Canh Bot Loc – a more translucent and chewy version of the noodle and Banh Canh Cha Ca – the dish includes fish cake.